Update: Baltimore County Police have identified this man as William McMillan Dorsey of Fuller Avenue. He has been charged with two counts of robbery and four counts of armed robbery. He is being held at the Baltimore County Detention Center. Just before 11:30 p.m. a male suspect and female suspect entered the store, walked up to the soda fountain machine, and got sodas. The female then walked up to the counter to pay for her soda. As the cashier opened the register, the male walked around the counter, told the cashier to keep the register open, and took money from the register. Both suspects then fled the scene. At approximately 4 a.m., the suspect walked into the store, picked up some donuts, and put them on the counter. He then displayed a handgun and demanded money. He fled the scene with an undisclosed amount of money. Just before 8:30 p.m., the suspect entered the store and approached an employee. He grabbed the employee and pressed something against her side that she thought was a gun. The suspect then took the employee to a register and told her to open it or he would shoot her. He took money from the register and fled the store. Just after 8 p.m., the suspect entered the store. He grabbed an employee, took him behind the counter, and told him to open the register. The male fled the scene with an undisclosed amount of money. The suspect entered the store just before 6 a.m. The suspect displayed a knife and demanded that the employee open the register. The suspect fled the store with an undisclosed amount of money. The suspect entered the store just before 8:30 p.m. He looked around, and then went into the bathroom. The suspect later exited the bathroom, went behind the counter, and approached the cashier. The suspect put a knife to the cashier’s side and demanded that the cashier open the register. After obtaining an undisclosed amount of money, the suspect fled the scene. 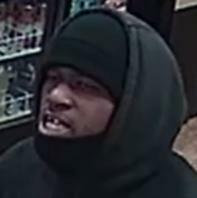 Baltimore County Police are hoping you can identify the man who robbed a Baskin Robbins in Parkville on November 11th. Police got a good picture of the man on surveillance cameras. 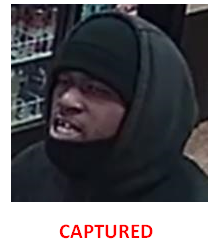 Just before 8:30pm on November 11th the man entered the Baskin Robbins store on the 2300 block of East Joppa Road. Once inside he grabbed an employee and pressed something against her side, police say she thought it was a gun. He then took her to the cash register and told her to open it or he would shoot her. She opened the register and the suspect took off with money. Anyone with information is asked to submit an anonymous tip to Metro Crime Stoppers, click here.